Let me tell you about our spinach empanada addiction. Almost every Saturday morning, Ricky and I would head to our favorite Cuban bakery where they serve an assortment of Spanish delights, most of which we could not eat. You see, almost everything in a Latin bakery contains some sort of animal product. Even the Cuban bread has lard in it! Being vegan and all, we would always get the spinach empanadas. We were in love and didn’t miss the other delicious pastries made with cheese, chicken, or beef. Unfortunately, as we became more vegan-savvy, we realized that their spinach empanada recipe contained butter! 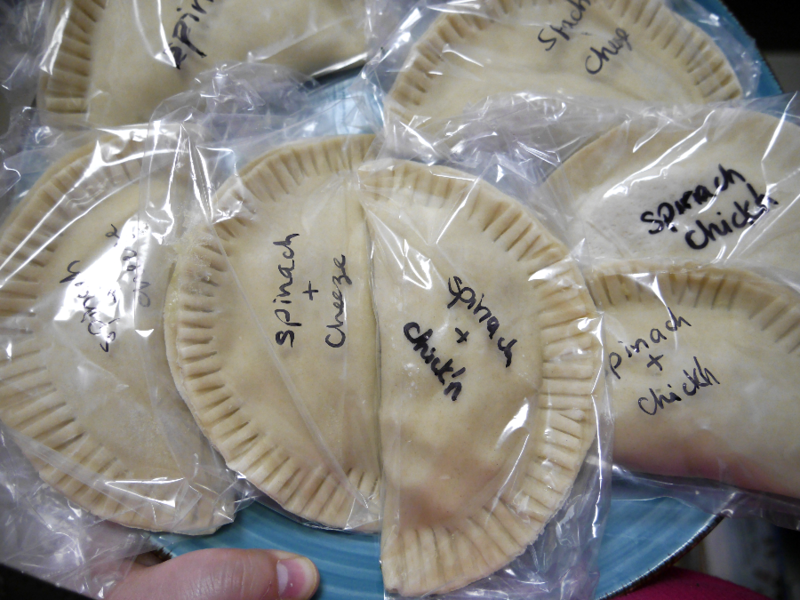 This is the story of how these vegan, spinach empanadas came to be. 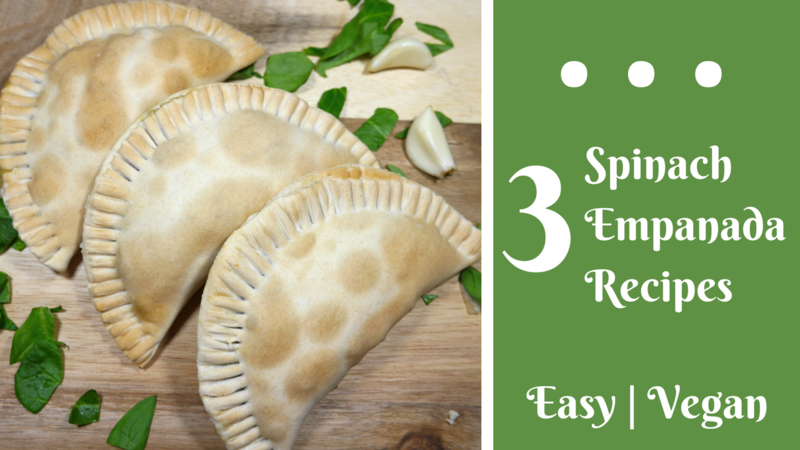 After recreating the basic spinach and garlic empanada recipe, I realized how versatile this recipe is. So, I decided to create three versions inspired by Cuban and Spanish cuisine: Simple spinach and garlic empanadas, vegan chicken and spinach empanadas, and vegan spinach and cheese empanadas. Although these can be fried or cooked in the oven, I chose to make them in the air fryer. I find that they cook quicker than baking them in the oven and without all the extra fat that regular frying imparts. These can be eaten for breakfast or lunch and make a great snack. Each recipe is easily doubled. 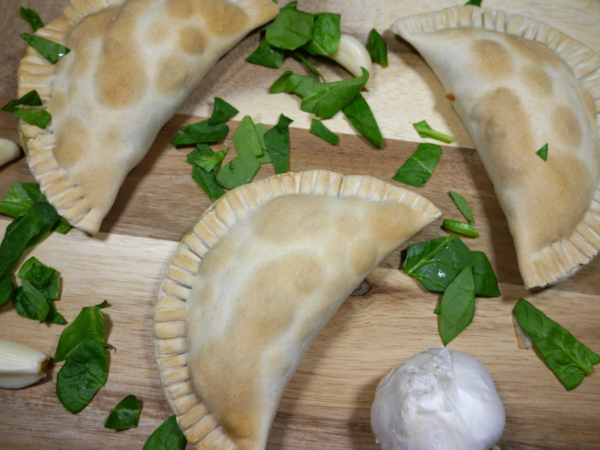 The empanadas freeze well and are perfect for making in larger batches. Simply pop the frozen empanadas into the air fryer for 15 minutes. These vegan spinach empanadas can be eaten for breakfast or lunch and make a great snack. The recipes freeze well and are perfect for making in larger batches. I prefer to bake them in my air fryer. It's quicker than baking and healthier than deep frying. In a pan, on medium heat, add butter and garlic. Cook until fragrant, for about a minute or 2. Don’t overcook to avoid burning the garlic. Add the spinach. Stir continously to encourage wilting and avoid burning. When the spinach starts to wilt, add the onion powder and salt. Once spinach has cooked thouroughly and most of the water has evaporated, remove from heat. Let cool for a few minutes. 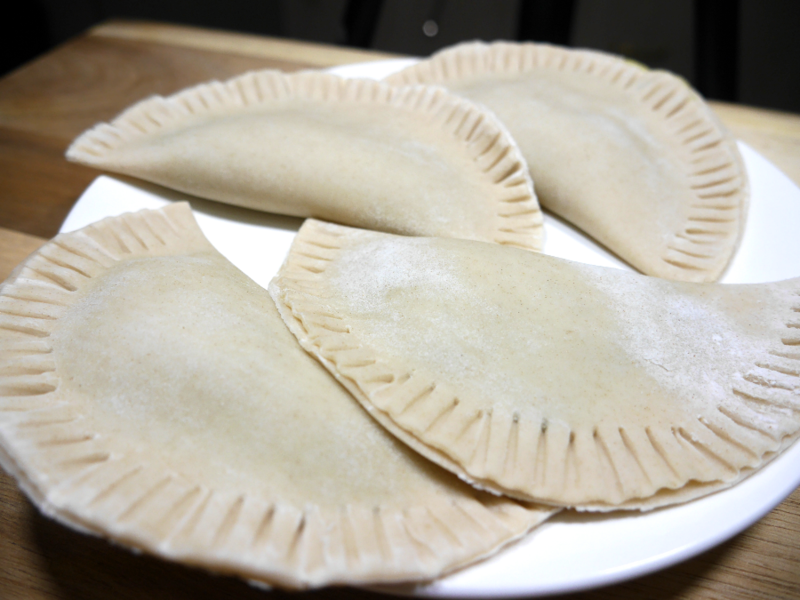 Fill Each empanada with 2 or 3 tablespoons of filling and seal closed. Place in air fryer in batched of 2 or 3 at 320 degrees farenheit for about 10 to 15 minutes or until golden. Add the shredded mock chicken. When the spinach starts to wilt, add the vegan mozzarella cheese, onion powder, and salt. Caution: Let cool before eating. Empanada filling will be piping hot. Freeze: This vegan recipe is perfect for making in large batches and freezing. Pop the frozen empanadas into the air fryer for 15 minutes.